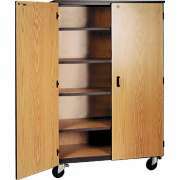 Buy Wooden Storage Cabinets For Your School or Office! What kind of cabinets have a natural look? 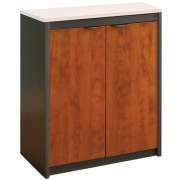 Wood storage cabinets give you the natural strength and beauty of wood with great storage. 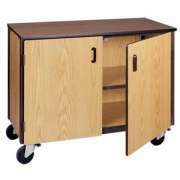 Hertz Furniture’s selection includes sizes and styles that are perfect for a classroom or office. 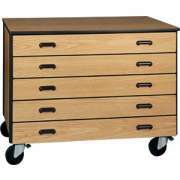 When it comes to keeping your space organized, this is an attractive option that will never go out of style. 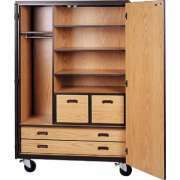 Wooden storage cabinets are incredibly versatile. 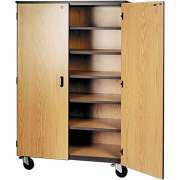 Most include various numbers of adjustable shelves so you can maximize space while getting a great fit for whatever you want to store. Convenient options such as various styles of locks and wheels let you find a style that fits your needs, no matter what they may be. What is the best material for cabinets? 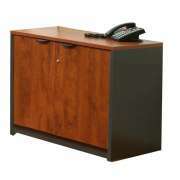 Wood storage cabinets are an ideal choice for virtually any space. 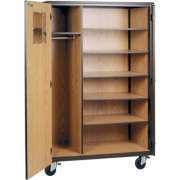 Their natural appeal is perfect for educational and professional environments. You can match the wood stain of cabinets with the other furniture in the room perfectly or choose a complementary shade to bring a fresh hue into the space. Even if the other furniture in your space is made of different materials, it can still look quite nice with wood. 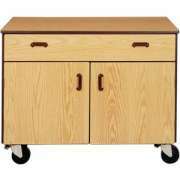 What are the benefits of wood cabinets? 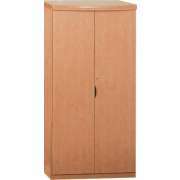 Aside from their natural beauty, wooden storage cabinets offer many additional advantages. On great thing about wood is its durability. While synthetic materials can mimic the appearance of wood, there is no replacement for its natural strength. With strength comes durability, so in addition to offering timeless style, wooden cabinets are also an investment in the future. They tend to last for years or even decades. 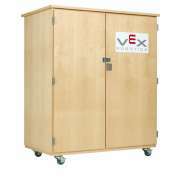 Aside from the strength of the material itself, the way in which wooden cabinets are assembled is also likely to be stronger than the build of synthetic materials. 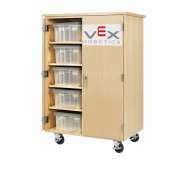 Wood storage cabinets with doors let you keep whatever you need on hand in your classroom or office without having to display it all out in the open. 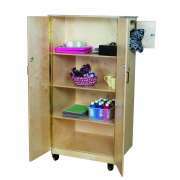 If you needs change over time, the shelves can always be adjusted to fit new materials or supplies. Additionally, unlike other materials, wood can usually be restained or painted an entirely new color if you want to redecorate without having to buy all new furniture. If you just want a small change, you can update the knobs or add other accents for a new look. 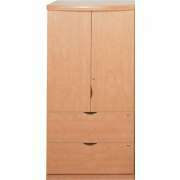 What size storage cabinets should I get? 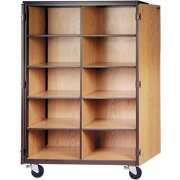 There is no one ideal size when it comes to storage. 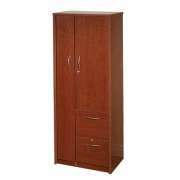 If you want to get as much room as possible while taking up as little floor space as possible, tall wood storage cabinets are the best choice. 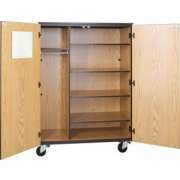 If you don’t need as much space and you want to make sure materials are out of the reach of young children, wall-mounted cabinets are ideal. 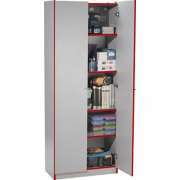 They can go above a desk or workstation so they are within reach whenever the contents are needed. 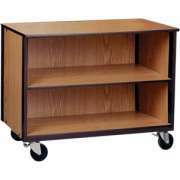 Wooden cabinets with wheels are ideal if you anticipate needing to move the contents all at once on a relatively frequent basis. 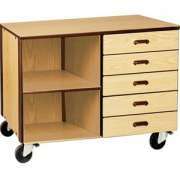 With this setup, instead of emptying the contents every time you need to move things around, you can simply roll everything into position quickly, easily and painlessly.